Are You Single And Over The Age Of 50? And Tired OF Being Alone And You Are Eager To Get Back In The Dating World? Do You Feel Overwhelmed By The Thought Of Dating? Well, Worry No More! Every minute, people from all walks of life connect to the Internet and thus, the Internet is a best place to meet lots of peopleof different age group, gender, religion, likes and dislikes, interests, nationality, character and beliefsall at the same time. Many people, old and young ones alike love meeting people online as this gives them the opportunity to learn of different cultures and interact with real people without the need to change locations. All you need is a computer, an Internet connection and youre on your way to meeting people online. There is no question that the popularity of online dating has revolutionized the way potential couples meet each other. These days, it is not uncommon for the average single person to participate in an online dating service. In fact, this trend is fast becoming the norm. In 2004, it was estimated that residents in the U.S. spent more than $460 million on online dating services. It goes without saying that online dating is big business in America. There are many reasons why people find this method of meeting new people so appealing. For one thing, everyone is doing it! The number of online dating services on the internet is so abundant, many of which offer services, absolutely for free. When it comes to senior dating, the number of online sites that offer up companionship and possible love are amazingly abundant. Its time for YOU to get started with online dating. I was scared at first, but we started chatting online and then met up in person. Now were seeing each other exclusively and it feels wonderful! I thought my days of dating and love were over once I turned 60. Then I met Ben. Im so glad I logged on and met him! So many seniors are finding that online dating isnt just for young people anymore. In fact, the senior online dating scene is becoming THE number one way that vibrant, alive seniors can meet people and get back to living their lives! 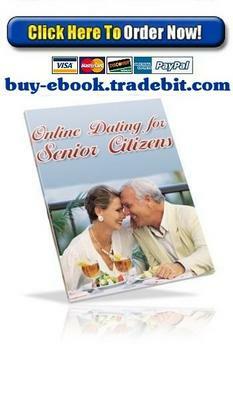 Many seniors, however, are intimidated by the Internet and getting involved in online dating. Now you dont have to be! Many seniors are apprehensive when it comes to online dating. Its that fear that can hold them back from finding that special someone. But weve made it easy in this valuable book! At first I didnt know what to expect when I signed up for an online dating service. Ive met so many nice people, now Im glad I took that first step and logged on! For many, online dating has become a successful endeavor for uniting countless singles. Many think that it is only for the younger segment of the population (ranging from 18 to 44 years old). But according to the 2000 Report of the Census Bureau of the United States, there are more than 31 million single Americans that have reached 45. Singles below 45 are around 51 million. So, out of 82 million singles in the United States, about 37.8 percent are seniors or more than a third of all the singles. That means that for every 10 singles checking an internet dating site, four of them are most likely to be seniors. Not sure its worth the price of $1.99! Thats alright. The best part about this deal is that if you order today, its completely risk free.